These figures from Jesús de Machaca (Bolivia) are affectionately called “Tilinchos,” meaning “small” in Aymara, the local language. Though dressed in the colorful costumes of the Aymara culture, their one characteristic feature are their eyes. Wider than heaven and darker than amber, they are an ever-moving kaleidoscope of frank curiosity and bottomless wonder. A true child's delight of conquering the world. Handsculpted, glazed terracotta figures created by Walter Melendres in La Paz, Bolivia depict infant Jesus, Mary, Joseph, three Kings or Magi, and several animals. 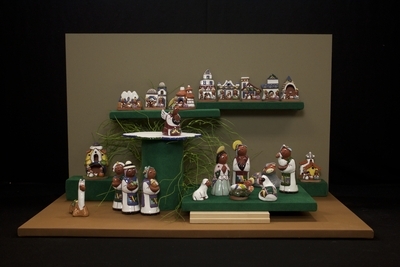 The miniature figures also depict the Holy Family. Exhibition label originally written by Fr. Johann G. Roten, S.M. for exhibit entitled "At The Manger: No Place Like Home" held at Roesch Library, University of Dayton.